It’s that time of year again. As the holiday season wraps up we are already thinking ahead to those warm summer months. We’ve all started planning and searching for ways to occupy the kids for those 9 weeks of summer vacation. In this age of technology, day camps can provide the perfect way for kids to disconnect from the Internet and grow socially by forging relationships and memories to last a lifetime. A lot of things go into finding the summer camp that’s right for both you and your child. It’s important to consider your child’s personality when choosing a camp. Involving them in the process insures that they end up at a camp that’s right for them. 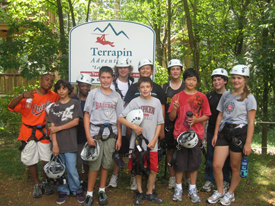 It’s also important to pick a day camp that has appropriate activities and activity levels for your child. You wouldn’t want to sign your child up for a camp that goes biking if they don’t know how to ride a bike! Once you have an idea about what camps your child would like to attend it’s important to research those camps. One of the most important aspects of a great camp is its staff. A great staff can make or break the camp experience so it’s important to look into the staff-to-camper ratio and ask what kind of training the staff goes through. A great counselor will keep your child safe and engaged, promoting personal growth and creating those fantastic camp memories. There are a lot of great resources out there to find the perfect summer camp for you and your child, even magazines and books dedicated to it. I personally would start by searching the web. I realize this can be a little daunting, but many camp websites provide helpful information and reviews that are a great starting point in your search. From there you can talk to the camp’s staff directly to answer any further questions you might have. Below is a checklist you might find useful. Does the camp have a Zip Line? High Ropes Course? Giant Swing? Yes, yes & heck yes! Is my child interested in these activities? Of course! Will every camper spend time on/in the water? We keep it cool. Are staff CPR/first aid certified? You betcha! What special training — certified in Archery, Kayaking, Mountain Biking, etc… — does staff have? All that and more! Are they equipped to handle my child’s special needs? Inclusion is our game. Is equipment up to date and regularly inspected? Yup! Do they provide regular feedback on my camper? Spoiler alert: they’re great. This entry was posted on Monday, January 8th, 2018 at 1:43 pm. Both comments and pings are currently closed.